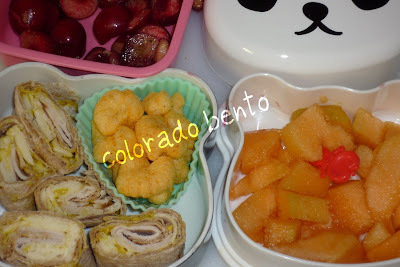 Summer Break has begun here in Colorado, so during the next two months Colorado Bento will just be a lovely smattering of what we are eating for lunch. It's not necessarily going to be in a bento, well unless we have a reason to pack lunch on the go. Our goal is to update 2-3 times a week! 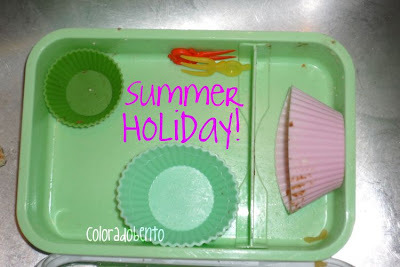 What's your favorite summer foods? My three year old, GL, loves to draw. She prefers pen over big chunky pre-k crayons. I allow her to use pens and even sharpie markers, although both come with some hesitation. When this is the result, I can't help be thankful that I gave her the freedom to express herself. Our family (left to right GL, Sj, J, and me). GL's drawings have just progressed in the last couple of months to where our arms are now coming from our bodies instead of our heads. The best part to me, we are all smiling. The cantaloupe is cut up, the juice is dripping all over the place, I grab the ingredients for a sandwich. I opened the drawer we keep our bread in to find NO BREAD. J, did you buy bread the other day? His reply, no. Yesterday when I went to the store, I didn't buy bread because I thought my husband did. Oh what a vicious cycle, I tell you. So instead I had to make do. We did have Diestel Turkey, cantaloupe, cherries, and barbecue Pirate's Booty. I looked in the refrigerator and found some tortillas. My daughter is a big fan of cheese quesadillas, but today I just made her a turkey wrap. I stick the tortilla in the toaster oven for a minute to soften it a bit (they harden in the refrigerator), added cheese, mustard, turkey, rolled it up, cut it, and called it done! Oh into the wee hours of the morning on either Thursday or Friday, this is what I was doing. Sorting, matching, assessing, pricing, piling, and purging. If anything was stained, had holes in it, or was missing a mate it went into the fabric recycling pile. Our local recycling center has a bin for discarded clothing that can't be reused, it's repurposed. For what, I'm not exactly sure?! I may have to look into that. Leftover Pizza, Oh The Delights Of Lunch! Mondays are the one day a week I let my daughter purchase lunch at school. Mondays are typically pizza day at school! Seeing as this is the last week of school, the calendar just says "chef's choice". Those terms to me basically says, lets use whatever we have left in the refrigerator to feed the kids all week. Now I could be wrong, but I could also be right. So she passed on buying lunch at school today. 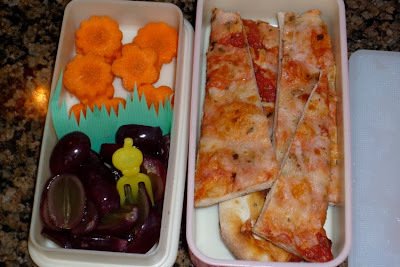 We just happened to have a few slices of leftover pizza in our refrigerator from dinner last night, so I packed my daughter's first pizza bento. Grapes and carrot flowers on the side. Voile, Pizza Monday it is! 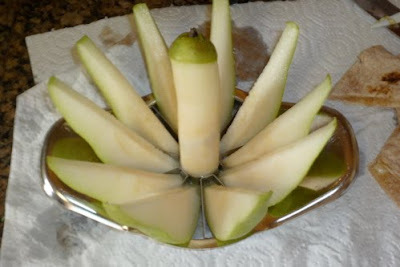 I love using something like an apple corer to also core a pear for school snack. For some reason, a pear or apple cut up in this way are just much more appealing to my girls, then when I slice them by hand. Go figure. Yard Sale, Was This MY Brilliant Idea? First it was talks of moving. Then the natural progression was to start preparing the house. I decided before we could start painting trim, doors, touching up, and staging this place we needed to purge. I started to attack the closets, cabinets, and dressers. The result...That is my dining room. It's the full on staging area for our yard sale. Honestly this is only stuff my girls have outgrown! I could open a boutique with baby girls clothes sized to 2T! Those Lowe's boxes are all full of toddler toys or toys the girls have decided to give up. The two black trash bags near the french doors, are full of cast off stuffed animals! Oh my goodness gracious. 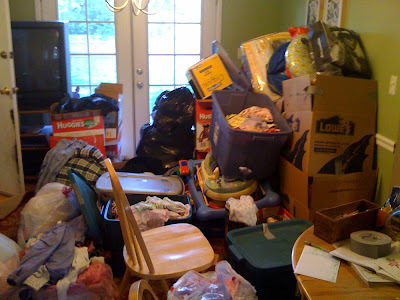 I am happy to embrace letting all this stuff go, so we can start fresh with our new home. Although the new home seems so far away in my mind. Last weekend I indulged in one of these after lots of house purging labor and I'm thinking next Sunday I will be as well. Fingers crossed, our Saturday sale will be a smashing success! Chinese food is a great doorbell dinner. It's here in a flash, but my theory is why order Chinese when you can make same thing at home in less time? I like to control the quality of ingredients in food that I consume, and in take out it's hard to do that. Unless you have a favorite restaurant and really trust their food (which I don't close by my home), it's better to just prepare yourself. I know there is no MSG in the food I am cooking fresh. This recipe is delicious and I always have the ingredients on hand. Isn't the saying the secret is in the sauce? This sauce is so simple to prepare and is NOT full of a bunch of chemicals. My girls love this as well. I add it to my stir fry vegetables and serve with brown rice or organic soba noodles. The noodles cook in 4-6 minutes, so if I'm in a rush it's noodles, if I'm prepared it's rice. Panda is one of my favorite bentos. I just love the size of it and how cute it stacks up, with the eyebrows being on the band that holds it together. Panda came from the Peppercorn in Boulder. That link is from the fall, but I was just in there this weekend and they still have a great variety of bento boxes (best in the Boulder area, I have to admit). My daughter had the privilege of working with a poet in her first grade class over the last six weeks during writing block. They had poetry readings and wrote their own poems. A poetry anthology was published containing poetry by all the students that participated in the outreach program. Today we attended the poetry reading in her class. I couldn't think of a more beautiful moment, watching my six year old read aloud her poem to an audience. I was a bit saddened that her poem was so beautiful about our dog (that we had to give up). At least it's a reminder of the beauty she saw in him. 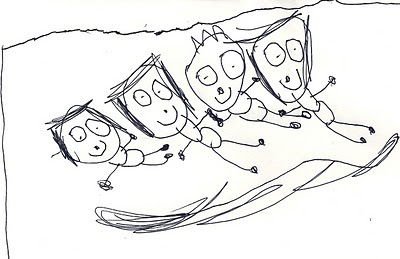 We have the original draft and revisions, to see the process of a six year old's mind is just incredible. Enjoy. eyes are as green as the grass in the summer. that falls on the ground. Now this trick was born out of pure randomness. Last week when I took my daughter swimming I was gathering up my belongings to hit the Rec Center. I packed up all of our stuff in my favorite, .60 cent IKEA reusable bag, which holds everything I need. As I took a look at my purse, I decided I didn't want to drag it along. I do lock up my stuff, but did I really need to drag my purse and wallet with me? It was a pretty easy decision, I'll just leave my wallet and purse safely at home (cars have been known to have been broken into at the Rec Ctr). I just needed my iPhone, my identification, and some cash I had. I guess the easy go to would've been a ziploc bag if I thought of it. I glanced down at our entry way bookshelf and saw an old on the go wipes container. Hmm, I thought to myself. Are Pickles A Food Group? This photos makes me laugh, just a tiny bit. I immediately look at the pickles in the picture, thinking they are just as prominent as the strawberries. For the record it was only half a pickle chopped up and it was a Bubbies Pickle. The ingredients on the pickle jar are as follows, cucumbers, artisan well water, garlic, salt, dill, and spices. No food coloring, no chemicals, just pure old fashioned pickles that are delicious. What is a ham and cheese sandwich with out a pickle on the side? The ingredients are so great in this jar of pickles we could even just call it a happy cucumber. 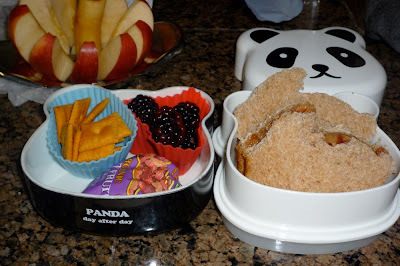 Today my daughter was lucky enough to have a homemade mini blueberry muffin in her snack (pink bento on the right). I placed a cutie in with it to balance out the snack offering, honestly whenever I can throw in fruit or vegetables I do. The puffs are from Whole Foods, 365 Brand. Another day, another bento happily eaten. Today is the day I feel honored to be a part of a group of amazing women. My friends and family constantly inspire me to do better, to be the best I can be. Better yet, the support I have surrounds me and holds me up when I most need it. Motherhood to me is celebrations big and small, mixed with those occasional days that are overwhelming but make me stronger. Today I can celebrate and honor the most important job i've ever had and love, being a mother. A special thank you to my husband for allowing me the great fortune of staying home with my girls. An extra big thank you to my mother for guiding me through out life, your support is incredible. 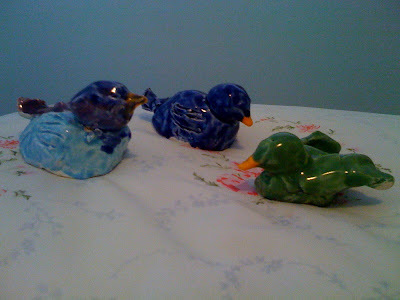 A glimpse into my morning: 3 little birds, made by Sj, wrapped gently and placed in a box, what a treasure to me. Breakfast in bed, prepared by J, he even baked the muffins. Yes, I am a lucky woman. Sometimes, no wait, more times than I care to admit I get bored of packing lunches. I am sure I am not alone in that sentiment. The notion of boredom alone was one of the driving forces behind Colorado Bento. If I was going to publish on a regular basis exactly what I am packing for lunch, it better be post worthy, right? This morning I just wasn't feeling like sending yet another sandwich into school. I gave my daughter some options, one of which was macaroni and cheese. 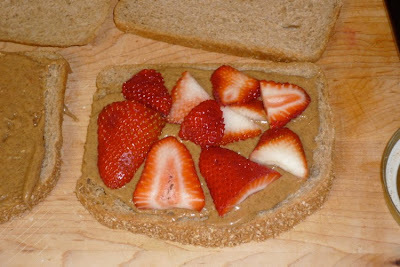 I don't mind making it in the morning, it's quick and easy and breaks up the monotony of bread based sandwiches. She jumped at macaroni and cheese, as I only offer it typically in a pinch about once a month. We buy Annie's macaroni and cheese by the case at Costco. It works out to be less than a $1.00 a box that way. Her sides today were mandarin organges (.79 cents a can at Whole Foods, 365 Brand), Veggie Booty, an organic pear (on sale $1.00 a pound this week). This morning around 8:45 I looked at GL and asked her if she wanted to go swimming. She casually put down her cup of smoothie and paused for a moment. I know she was thinking to herself, swimming? Her reply, "Sure, I'd love to." She proceeded to run up stairs in a flash to dig out her swimsuit from the top drawer of her dresser. Recently we had taken some hand me down swimsuits out of storage, so she was eager to chose a suit to her liking. Today she would wear her Paul Frank monkey swimsuit, which I just adore because quite often I refer to her as my little monk-a-la-ronk. This weekend I was able to sit down and watch the final episode of Jamie Oliver's Food Revolution. Quite honestly I was brought to tears out of shock, outrage, and sadness for the general state of how we feed our children. 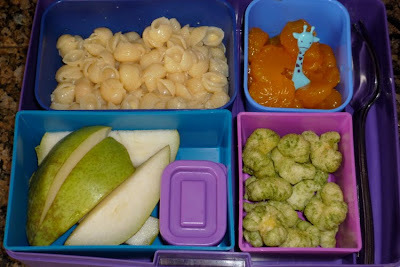 There was a backlash by parents of the elementary aged children against the new improved lunch system Jamie instituted. Instead of having their students eat the new healthy options at school, they started sending in brown bag lunches full of crap. Absolute garbage. One little girl had two bags of chips, a baggie of skittles, and a juice box as her lunch!!! Most of the kids didn't even have a sandwich in their lunch, it was Lunchables full of chemicals and processed ingredients and to top it off, blue jello on the side. Tuesday Tips: Are Your Favorite Vege Burgers Full Of Poisonous Chemicals? Sometimes I think I'm doing the right thing by purchasing brands I've come to trust. Those brands are typically found at "natural foods" stores and when I read the label, all the ingredients are recognizable. Quite honestly that's pretty much my top criteria for processed foods, if I can recognize ALL the ingredients in simple English, I'll buy it. Obviously it can't contain MSG, artificial colorings, flavorings, or high fructose corn syrup, but where I shop those items are rarely found in products. While we are not vegetarians in our household, my husband and I were vegetarians for over a decade. We enjoy eating meatless dinners about three times a week.